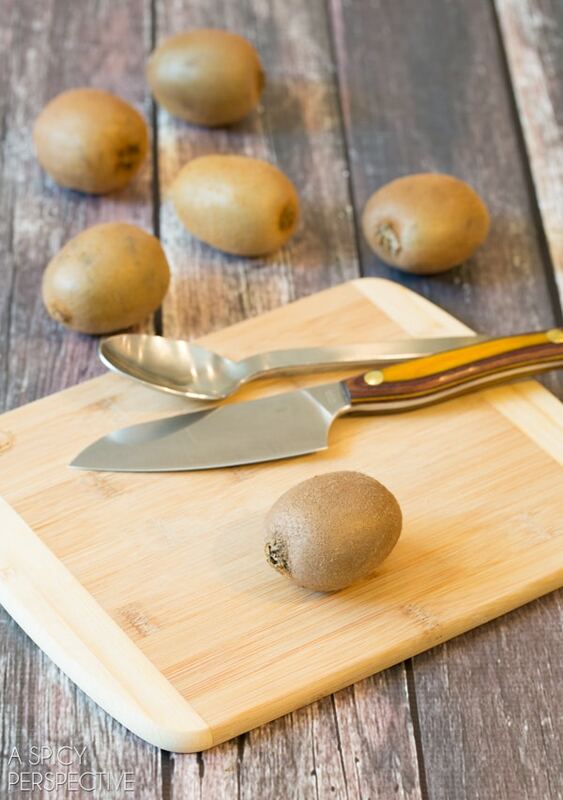 Have trouble peeling and cutting a kiwi without smashing it into mush? 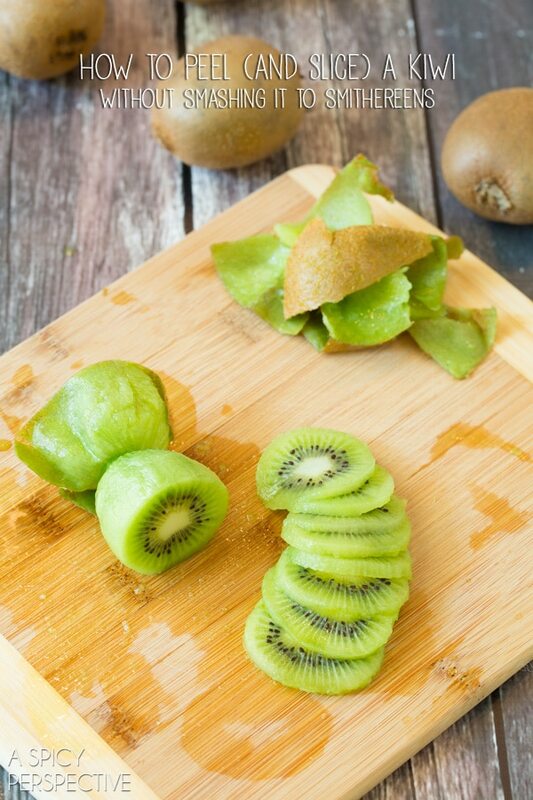 Today I’ll show you a quick and easy way of How to Peel a Kiwi! As we get closer to summer, my instinct to pick up exotic fruits at the market becomes stronger and stronger. Last week I bought two not-quite-ripe mangoes and a prickly pear, just for kicks. And I never ever can resist a kiwi when I see one. After all, they’re so cute and fuzzy, with that bright green, black, and white flower pattern in the center. I love that. Almost more than the flavor… but not quite. The problem with kiwi is, if it’s ripe enough to be sweet, it’s very easy to squash. The other day I watched my little girl brutalize a kiwi whilst trying to peel and slice it. She’s eleven… so if you know anything about eleven year old girls, you know there are times when it’s best to give them room to experiment, make mistakes, and ask for help, instead of trying to instruct or takeover the situation. They don’t react well to that. Needless to say, 3 kiwis died a horrible horrible death, before Ava looked up at me with eager eyes, ready for help. She was trying to use a veggie peeler to skin the kiwis, something I’ve watched others do in the past, and have even tried myself once or twice. Yet when a kiwi is nice and ripe, its nearly impossible to peel it with a vegetable peeler or knife, without smashing the fruit in the middle. My suggestion to Ava (and to you) is to cut the kiwi in half first, so that the circular pattern in the middle is exposed. 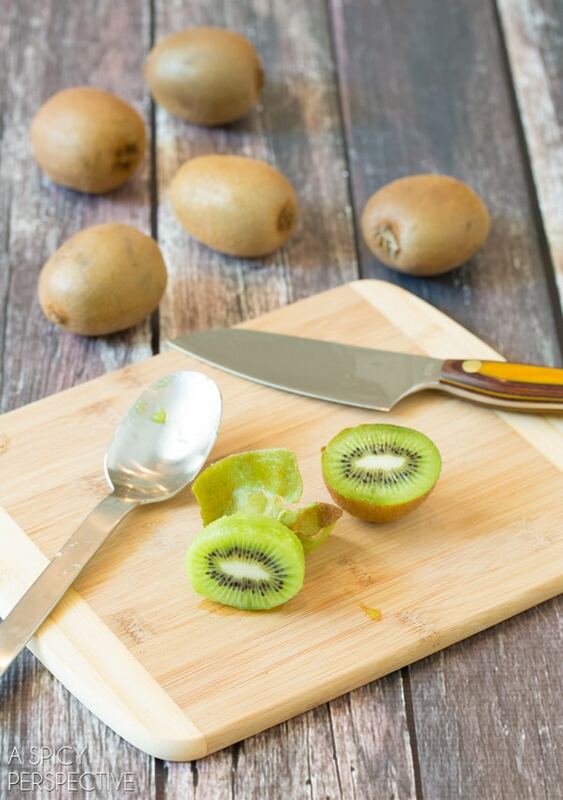 Then take a large tablespoon and gently scoop around the interior of the kiwi, separating the green flesh from the brown skin. 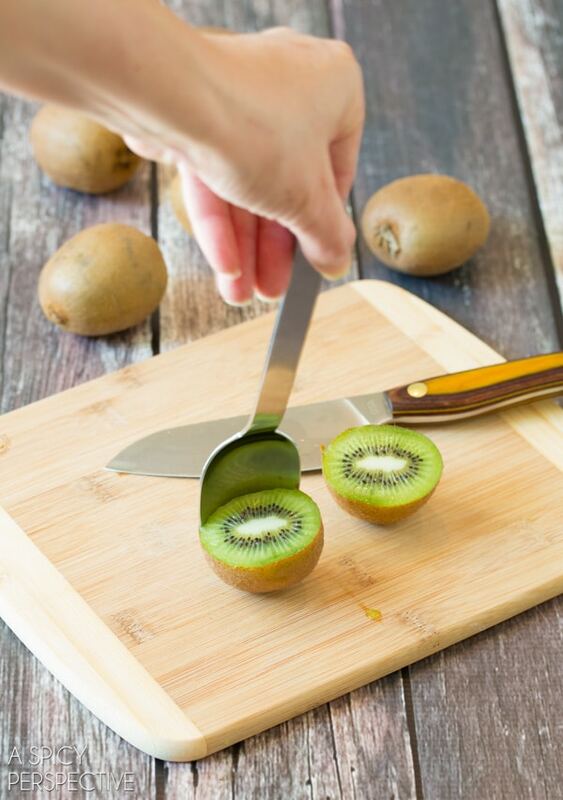 Pull the skin back on both sides, and use the skin as a handle while you slice the kiwi. Kiwis can be slippery little suckers! 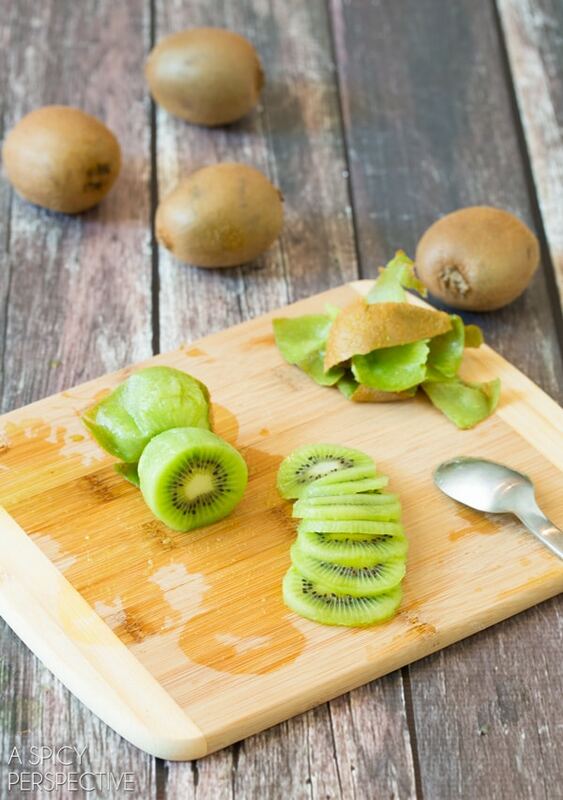 Perfectly sliced kiwi every time! 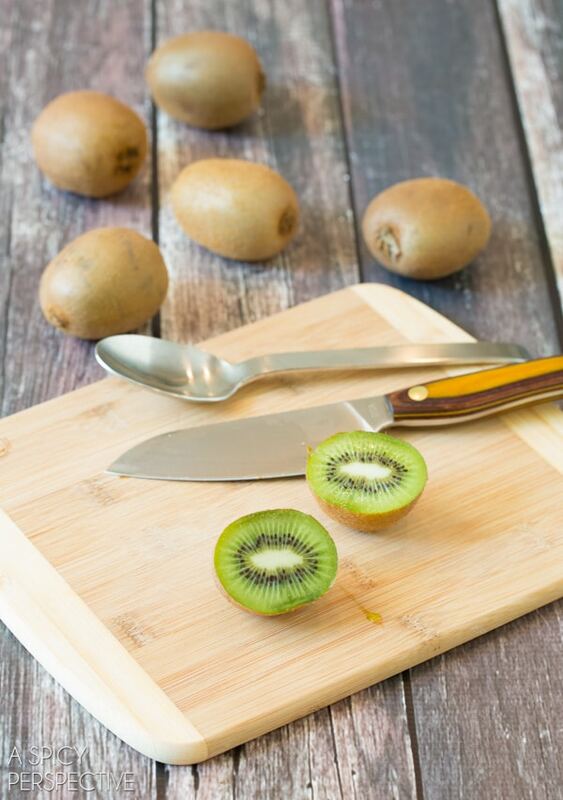 Kiwis have started arriving at markets here as well and every time I think of picking up a few, I always get intimidated since I’ve killed a few kiwis myself in the past and had to have Kiwi juice instead of lush, thick kiwi slices! Not anymore I guess! can’t wait to try this ! 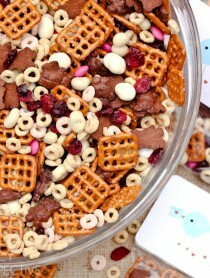 We’ll have to try this. 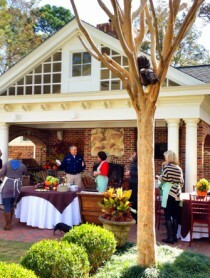 We scoop avocados out like that, too! That’s an awesome tip! I cannot wait to try it. The spoon method is very easy. Used to be the way I did it. Now, I just eat the whole thing – skin and all! 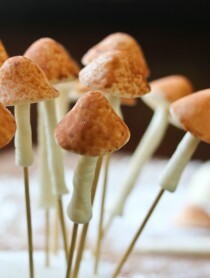 This is exactly what I do when I have to peel them….otherwise I just cut in half and eat them with a spoon! Excellent tutorial! I just bought a whole bunch of kiwis so I cannot wait to try this!